The 3D plug and patches available to the surgeon allow the surgeon to tailor the plug and patch to best fit the needs for initial inguinal hernia repair. Patients with a defect of 3 cm or smaller are excellent candidates for plug-and-patch repair. Poor candidates for plug and patch are patients with giant hernias, large recurrent hernias, multiply recurrent hernias, and obese patients where subcutaneous fat is greater than 5–6 cm. A surgeon should understand the plug-and-patch repair in its entirety. Components of the procedure are a combination of mesh and technique. Inguinodynia seemingly must come from one of four sources: Dissection, the plug, overlay patch, or fixation. It is a surgeon’s responsibility/obligation to properly identify and not injure nerves. However, if a nerve interferes with flat placement of the overlay, the nerve should be transected and ligated. Whatever plug material is used, its preperitoneal deployment should be larger than the defect it traverses. Cone-shaped mesh plugs require suture fixation. For cone mesh plugs, migration might be a concern. A single nonabsorbable loose stitch between the overlay patch and plug should prevent any risk of plug migration. Since the plug reduces the hernia immediately with implantation, the overlay need only be positioned correctly—not fixated. Surgeons have the option of using loose stitches, fibrin sealant, or nothing at all. Plug and patch has a short learning curve and a proven track record for low recurrence. 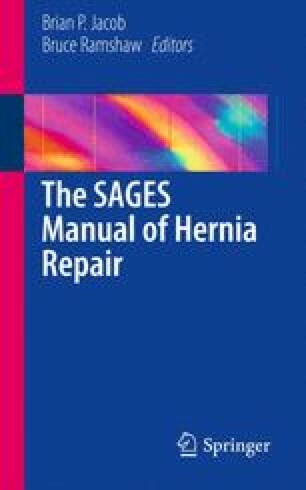 As a result of modifications of plug-and-patch materials and techniques, this durable procedure has culminated in fewer and fewer complications with a decreasing incidence of inguinodynia. The plug-patch will remain a popular choice for inguinal hernia repair for years to come.